Each case contains (6) 1.5 pound cans of Instant Potato Flakes. Honeyville's Premium Quality Instant Potato Flakes are an excellent nutritional food source for family preparedness. 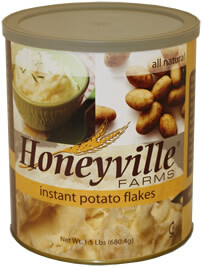 Honeyville's Potato Flakes have been carefully processed from select Idaho potatoes. Easy to prepare, with a great potato taste, just 2 cups of potato flakes (4 servings) are the equivalent of 1 pound of fresh potatoes. Product application: May be used as whipped or mashed potatoes or in casseroles or bakery recipes calling for potato flakes. May also be used as a thickening agent. Storage: Dry pack Potato Flakes may be stored in original sealed, oxygen-free cans for up to 15 years. All Honeyville family preparedness products are dry packed using oxygen absorbing packets which have been found safe and effective in eliminating oxygen in a sealed #10 can, providing ideal conditions for long term storage. Ingredients: Potato Flakes (color and flavor protected with sodium bisulfite, citric acid and BHA), monoglycerides, sodium acid pyrophosphate.